When I started the fabric of our lives series of guest posts, I thought about some of the people who could really help celebrate my favorite natural fiber. 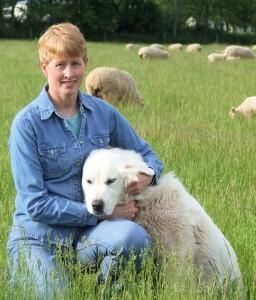 oddly, one of the names that came to mind is normally connected to sheep — my friend Sally Colby Scholle who lives in Pennsylvania & has sheep. She tweets as @sheepwriter blogs about it at http://sheepwriter.wordpress.com/. I couldn’t tell if it was really nervy to ask her to write about natural fiber or not so I told her it was fine if wool got equal time, cause she and I both know the various natural fibers all play a role for us. I love the post she came up with too! I was one of those wiggle-worm kids who just couldn’t sit still in school. Every teacher is blessed with a few of us fidgety kids, and I hereby apologize to all of the teachers who had to tolerate my squirminess. Now I realize that part of the reason I was so restless was because I just couldn’t stand the way my little plaid dresses felt. They were itchy. I didn’t know this at the time, but I’m sure that the reason those dresses didn’t feel quite right is because I was in elementary school when the great new P fabric was introduced. My mom hit the homemaker jackpot – she no longer had to iron my cute little dresses. I, however, drew the short straw and had to wear itchy clothes. Somehow I adjusted and made it to junior high, where my home economics teacher assigned a fabric identification project. I was lucky – my mom sewed, and we had a multitude of fabric scraps. I loved learning the names of the pretty cotton fabrics as I carefully stapled them to a piece of poster board … seersucker, chintz, chambray, gingham, denim. Ahh…denim. With two jobs – farmer and ag writer – I can almost always wear whatever I want. I have old, broken-in jeans that are perfect for whatever I have to do in the barn or in the field. Some have patches, some should have patches, but they’re all comfortable. I love the durability of denim jeans and how they become part of me. I also love denim’s other life as deep-dyed indigo blue for dressy jeans. In close second for favorite clothing are my cotton t-shirts. The long-sleeved versions are perfect for layering in winter, for in-between weather and for sun protection in summer. Cotton sweatshirts are great for unexpected changes in weather, so I usually keep one in the front of the four-wheeler. When I shop, I always look for the cotton label – it means clothing that won’t itch, pill or look thin and worn before its time. Although my first choice for everyday wear is a cotton t-shirt, my dressy cotton shirts are the perfect choice for pairing with dark jeans when it’s time to look like something other than a farmer. Since we raise sheep, all this cotton talk might make me sound like a traitor. But wool is another natural, renewable fiber that, like cotton, has a multitude of uses and blends well with cotton. I often use the sleeves from worn-out cotton sweatshirts to make little coats for chilled lambs. If that isn’t the perfect match, nothing is! In cotton, I can walk around the pasture checking new lambs, trim hooves, milk goats, ride a horse, work in my garden, meet with farmers at a field day, go shopping, attend an ag meeting or have dinner with friends. What else is there? Thanks, cotton farmers, for growing my jeans and shirts! Do you have a story about cotton? Whether you wear it, make things with it or grow it, I’d love to share your story here in the series of posts on how cotton is the fabric of your life. « Instead of Country Roads, They Could Have Been Cotton Roads? Great guest post. I pretty much live in jeans and t-shirts every day so I can express the same sentiments! I miss those days… Went back to the office after working from home a couple of years, lucidly there are more office clothes made of cotton too!